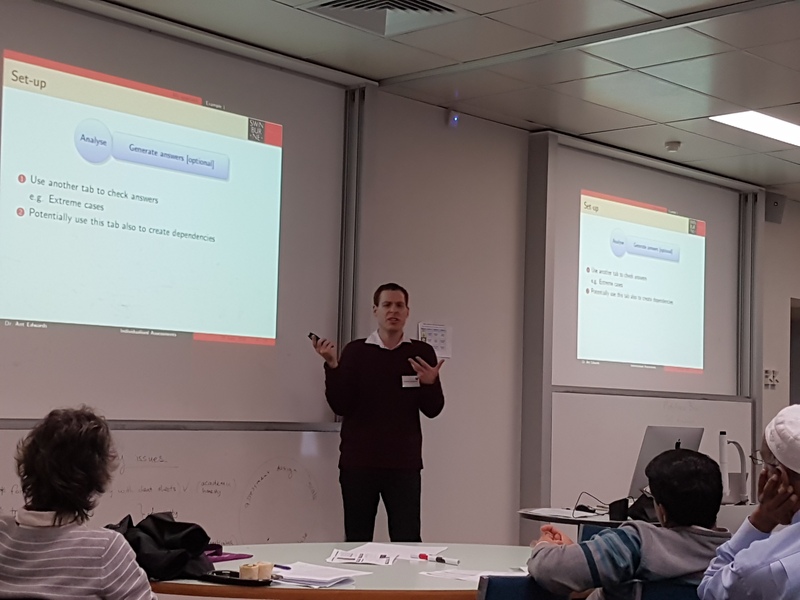 The 2018 FYiMaths workshop was held at The University of Melbourne on June 28th – 29th. The workshop focused on different approaches to assessment, with many focusing on the use of rubrics and its role in providing feedback. Keynote presentations included Janine McIntosh from AMSI who discussed the current outreach work that AMSI is doing with schools encouraging the inclusion of girls in STEM, Cristina Varsavsky from Monash University who discussed the current state of Maths Assess, and a final keynote with Mark MacLean from UBC who showcased an exciting new assessment process called PairCompare. The program for the day can be found here. Presentations can be found below. Nazim Khan Assessments: What do students think? included all first year level mathematics and statistics units. business statistics units and statistics for science. There are many factors to consider when designing quality assessment. It should be valid in that it accurately measures what it is intended to measure, fair so that it gives all students an equal opportunity to demonstrate what they know, reliable so it gives the same, consistent result regardless of when or where the assessment occurs or who does the marking and manageable or appropriate in size and cognitive load for the students being assessed. Two other aspects of assessment also motivate academic choices. Marking complexity and its effect on workload is a time and economic constraint within the modern university and we are being asked to mark more efficiently. There is a strong argument for authenticity in assessment scenarios, both as a way of engaging students but also as way of incorporating work-integrated tasks within courses. Technology such as Learning Management Systems seem to offer solutions for minimising the marking workload whilst still creating tailored authentic assessment. For example, Moodle’s quiz capabilities can creatively applied to auto-mark complex scenarios. Three different examples from first year courses in essential mathematics for science and statistics are showcased to illustrate some of the ways tailored quizzes can be used to reduce the marking workload for academics, allow the construction of authentic assessment tasks and provide timely structured feedback for students. Many papers report on the effectiveness of mathematics support workshops on student outcomes for mathematics subjects at tertiary institutions. How are these effects moderated by students’ background ability in mathematics, attendance at classes and online activity in subject based tasks? We have gathered data on mathematics background, tutorial attendance, interaction with the learning management system, use of mathematics support, and final marks for a cohort of students taking a foundation level unit in engineering mathematics. Using statistical modelling techniques we examine the relative effects of each of the predictor variables on the final mark and come to some unexpected conclusions. Amongst these is the prediction that if higher use was made of mathematics support by all students, failure rates in the unit could drop by an order of magnitude. The mathsassess project has stimulated much discussion and reflection on mathematics and statistics assessment practices in Australia. Inspired by mathsassess, we trialled a criterion-based rubric for assessing a written assignment in an introductory statistics subject. As part of the trial, we compared the rubric-based assessment approach with the traditional, marking scheme-based approach, in terms of consistency of marking, clarity of expectations and quality of feedback for students, and ease of use for markers. In this presentation, I will report on the development of the rubric and on our research comparing the two assessment approaches, and reflect on the role of resources such as mathsassess in assessment. Delivering authentic assessment within first-year finance, statistics or applied mathematics courses can bring many difficulties for an educator. Such assessment activities require a substantial investment of student time to complete, and so cannot be delivered in time-pressured setting such as a test or exam. First-year students typically haven’t met the mathematics that would be used in many authentic settings, and so there are limits to the sophistication of what can be asked of them. There is therefore a narrow scope to set problems that encourage varied mathematical treatments. Putting all this together with the pressures on staff workload to mark such projects, it might seem that the only option is to give students identical projects. This in turn can result in difficulties detecting academic misconduct and plagiarism. In this talk I discuss a number of ways to use technology to both auto-generate individualised assignments and to either auto-mark or assist with marking in some way. These include mail-merging between R, Excel and Word (in the sense of Hunt, 2005), the LaTeX assessment macro “auto-multiple-choice” (described by Pérez-Benedito et al., 2014), and the online question engine Numbas (developed by Foster, Perfect & Youd, 2012). The first of these approaches has been used successfully in a variety of first-year Units at Swinburne for assessments worth around 10%-15% of students’ total grade. Foster, B., Perfect, C., & Youd, A. (2012). A completely client-side approach to e-assessment and e-learning of mathematics and statistics. International Journal of e-Assessment, 2(2). Hunt, Neville. (2005). Using Microsoft Office to Generate Individualized Tasks for Students. Teaching Statistics. 27. 45 – 48. Pérez-Benedito, J. L., Aragón, E. Q., Alriols, J. A., & Medic, L. (2014). Optical mark recognition in student continuous assessment. IEEE Revista Iberoamericana de Tecnologias del Aprendizaje, 9(4), 133-138. As well as being a tool for measuring achievement of learning outcomes, assessment can be seen as an important signal of what we value. Often we assess what is easy to measure, rather than what we want to develop and grow, and we fall into the trap of only using “assessment OF learning” rather than “assessment AS learning”. Inspired by the MathsAssess project, we have been working on diversifying our assessments to ensure we assess and develop a broader range of outcomes in our students, and to make use of the assessment process as a learning experience in itself. I will outline some of the diverse approaches to assessment that we have been employing at Curtin University. These include oral assessment of problem-solving in a whiteboard tutorial setting, as well as nested assignments with multiple submission phases using individualised student-provided data, and individualised student assessment contracts or “choose-your-own-assessments”. Each of these has been employed in a range of mathematics units, mainly at first and second year, of varying sizes. Some of these scale better than others to larger classes – in particular, the oral assessment was chosen in some units precisely because it ends up being more efficient for marking time and aligns well with the teaching style. I will aim to give an outline of some of these different approaches and allow ample time for questions and discussion of different assessment practice. Victoria University (VU) Melbourne commenced an Australian-first, First Year Model in 2018. The First Year Model presents a unique block mode delivery of which four blocks have been completed so far. This change presented an opportunity to unpack, redesign and redevelop first year units to innovatively and effectively meet the new opportunity, requirements and constraints. It is evidenced that the combination of the block teaching model and online assessment system for VU Business Statistics channelled students to grow a stronger learning culture by engaging in work away from class including practicing online questions, even multiple times. This learning culture resulted in higher marks for both online and paper base assessment components and it is expected that these benefits will continue across their studies in other units thereafter. The overall fail rate for Business Statistics has significantly dropped from an average of 31.5% and 34% in Semesters 1 & 2, 2017 respectively to only 13% in Blocks 1-3, Semester 1, 2018. HD and D grades make up a higher proportion in 2018 with average 57% of all grades vs. 23.6% and 34% in Semesters 1 & 2, 2017 respectively. Student Evaluation of Unit (SEU) is up with all ratings 71-100% and student comments are increasingly positive. A further benefit of restructuring this unit for both students and academics is seeing a significant reduction in processing special consideration applications.